Below are notable historic and upcoming celestial events for 2019 that are visible from the Nashville/Brentwood area. All times are local. Please refer to our event calendar to see if Dyer Observatory is planning a special viewing for any of these events. 8.5″x11″ pages can be downloaded HERE: 2019-Celestial Calendar PDF. January 2 – Earth at Perihelion at 11:20pm. The Earth is at its closest point to the Sun for the year at 91,403,554 miles. Earth is also moving at its highest orbital velocity as the gravity of the Sun boosts our planet’s speed as it swings by. 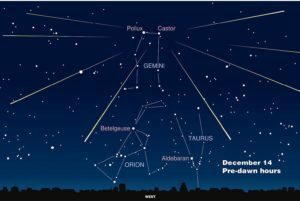 January 3/4 – Quadrantid Meteor Shower Peak. This shower is distinctive for it has an especially brief peak and is associated with an asteroid (2003 EH1) rather than a comet. You might observe up to 25 meteors per hour radiating from the area just north of the constellation Boötes. There will be no Moon in the night sky to wash outer fainter meteors, yet visibility would be best after midnight. January 4-8 – Latest Sunrise of the Year at 6:59am. January 20/21 – Total Lunar Eclipse, Wolf Moon, Supermoon. All of North and South America, including Nashville, will enjoy seeing the full eclipse over a period of 5 hours and 12 minutes. Penumbra is first visible at 8:36pm, partial eclipse begins 9:34pm, and total eclipse begins 10:41pm. Maximum eclipse will be at 11:12pm. 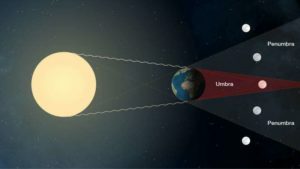 Then the show will bow out with the total eclipse ending at 11:43pm, the partial eclipse ending Jan 21 at 12:50am, and the penumbral eclipse ending Jan 21 at 1:48am. The penumbral stage of the eclipse is rather subtle, whereas the partial eclipse will show the darker inner shadow of the Earth crossing the Moon. If it is cloudy where you are, you may stream it at https://www.timeanddate.com/live/. A lunar eclipse occurs when the Earth blocks the Sun’s light to the Moon. In this NASA illustration, you may see how the Moon orbits behind the Earth through the partial shadow (penumbra) and the full shadow (umbra). The Moon appears red when in the umbra because of scattering of bluer colors of light by Earth’s atmosphere. February 11 – Dr. Carl Keenan Seyfert Birthday. On this date in 1911, the Dyer Observatory’s first director was born in Cleveland, Ohio. He graduated from Harvard and served at multiple observatories including Yerkes, McDonald, Mt. Wilson, and Warner Swasey. 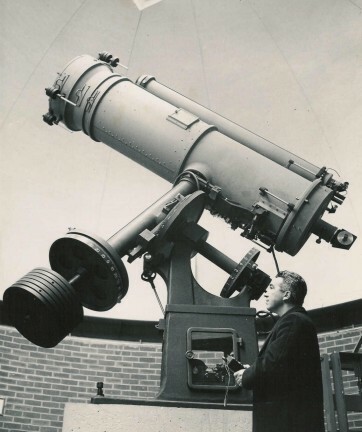 Upon his arrival at Vanderbilt, he took on the challenge of reinvigorating the astronomy program and the building of the modern Dyer Observatory completely with community donations. Dr. Seyfert is known for his research on galaxies and is immortalized by having a class of galaxies, a grouping of six galaxies known as “Seyfert’s Sextet,” a 54km-wide crater on the far side of the Moon, as well as the Dyer’s 24” telescope named after him. 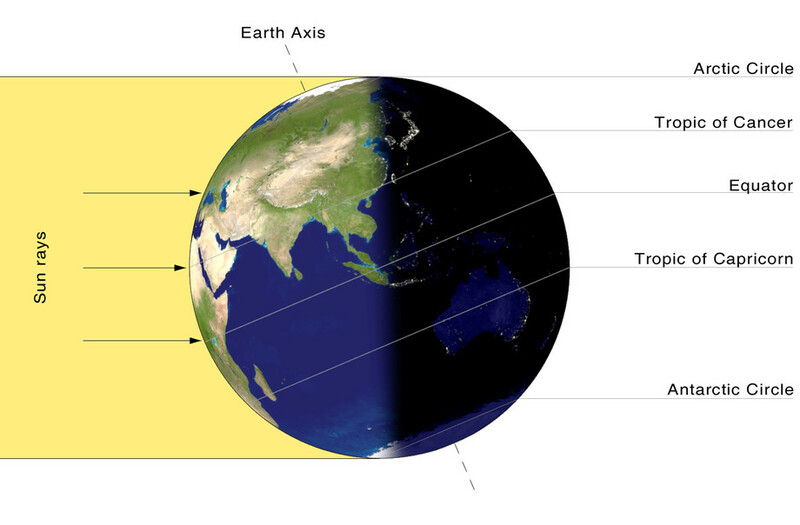 March 20 – Spring Equinox at 4:58pm. The Sun will shine directly on the equator and there will be nearly equal amounts of day and night on the entire surface of the Earth. This date marks the first day of spring in the Northern Hemisphere and autumn in the Southern Hemisphere. April 21/22 – Lyrid Meteor Shower Peak. This display is produced by dust particles left behind by comet C/1861 G1 Thatcher, which takes approximately 415 years to orbit the Sun. The comet will next be visible from Earth in 2276. Meteors will radiate from the constellation Lyra at a rate of 15-20 meteors per hour, but may appear anywhere in the sky. Best viewing may be just before the nearly full Moon rises around 10:00pm, or after midnight in a dark location. The few nights before and after will also offer peak viewing. May 6/7 – Eta Aquariid Meteor Shower Peak. This shower is notable for it is produced by dust particles left behind by the well-known comet Halley—which is also the source of debris for the Orionid shower in October. The comet orbits the Sun every 76 years, making it next visible from Earth in 2061. The shower runs annually from April 19 to May 28. Meteors will radiate from the constellation Aquarius, but may appear anywhere in the sky at the rate of 10-30 meteors per hour at Nashville’s latitude. The Moon will be an early-setting slim crescent, so it is not likely to interfere with viewing. May 27 – Arthur J. Dyer Birthday. 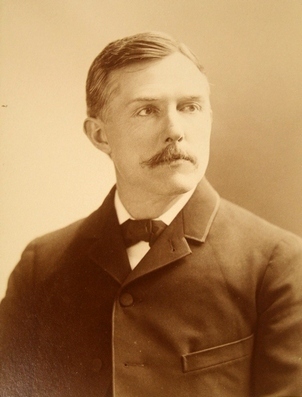 Our observatory’s namesake was born in 1868 in Medfield, Massachusetts. 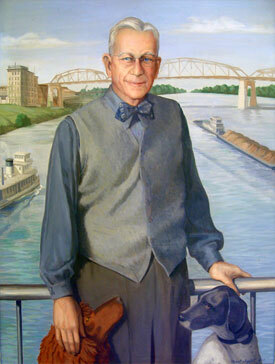 Dyer graduated from Vanderbilt with a degree in engineering in 1891 and went on to found the Nashville Bridge Company, which engineered and built bridges throughout the Americas before diversifying into general construction and shipbuilding. His asking of Dr. Carl Seyfert to set up a sundial on his property was the genesis of a relationship that financed the fulfillment of Seyfert’s vision to build Vanderbilt’s new observatory in the early 1950’s. June 9/10 – Jupiter at Opposition. The gas giant will be at its closest approach to Earth and the disk will be fully illuminated by the Sun. It will appear at its brightest this time of year, and offers a good chance for those with a telescope to see its four large Galilean moons. June 12-14 – Earliest Sunrise of the Year at 5:29am. June 21 – Summer Solstice. The solstice occurs at 10:54am, marking the beginning of our summer and providing 4 hours and 55 minutes more daylight than on the winter solstice. This also marks the start of winter for those in the Southern Hemisphere. This NASA illustration shows how the Earth is tipped 23.5 degrees, allowing the Sun’s rays hit the Northern Hemisphere to create summer. June 27-30 – Latest Sunset of the Year at 8:08pm. July 4 – Earth at Aphelion at 5:11pm. We are at our farthest point from the Sun, and as a result, are moving at the slowest speed in our orbit. July 16 – 50th Anniversary of Apollo 11 launch at 8:32am. A Saturn V rocket lifted off from Kennedy Space Center carrying Neil Armstrong, Michael Collins, and Edwin “Buzz” Aldrin for the first mission to land humans on the surface of the Moon. July 20 – 50th Anniversary of Apollo 11 lunar lander “Eagle” touchdown on the Moon at 3:17pm. Six and a half hours after the landing, Neil Armstrong first stepped onto the surface and uttered the famous words, “That’s one small step for [a] man, one giant leap for mankind.” Buzz Aldrin joined him soon after for a two and a half hour moonwalk. July 24 – 50th Anniversary of Apollo 11 splashdown at 11:50am. After a trip of 8 days, 3 hours, 18 minutes and 35 seconds, the crew was picked up by the USS Hornet 900 miles southwest of Hawaii. 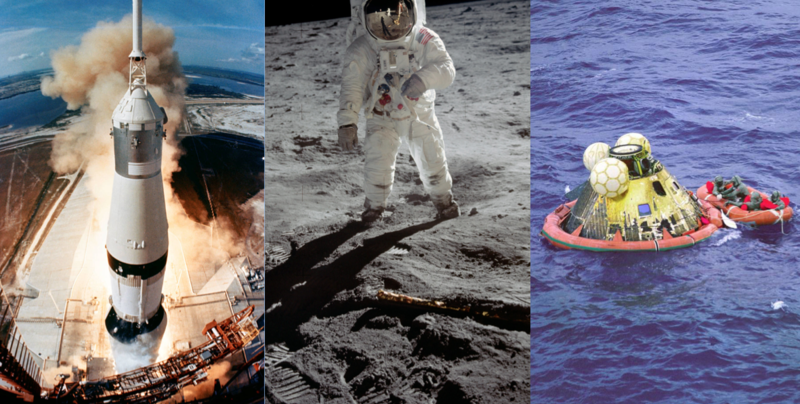 These NASA images are of the Apollo 11 liftoff from Kennedy Space Center, Astronaut Buzz Aldrin walking on the Moon (photo by Neil Armstrong), and the crew’s splashdown in the South Pacific. July 26/27 – Alpha Capricornid Meteor Shower Peak. The entire shower lasts from July 11 through August 10. It typically produces about five meteors per hour, but they are notable for being bright fireballs. The parent object is comet 169P/NEAT, which was discovered in 2002 and orbits the Sun every 4.2 years. Optimum viewing will be around midnight. July 29/30 – Southern Delta Aquariid Meteor Shower Peak. This shower is active from July 21 through August 23 and may produce up to 20 meteors per hour during the week around this peak date. These typically faint meteors will radiate from the constellation Aquarius but may appear anywhere in the sky. The Moon will cause very little interference because of its near-new phase. Best viewing will be just after midnight. August 12/13 – Perseid Meteor Shower Peak. The Perseid meteor shower is one of the brightest and most prolific showers. The entire shower runs from July 13 to August 26 and is created by debris left behind by comet Swift-Tuttle, which was discovered in 1862. 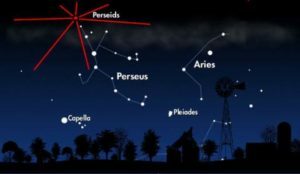 Meteors will radiate from the constellation Perseus at rates of up to 75 meteors per hour but may appear anywhere in the sky. A nearly full Moon will interfere with viewing until two hours before sunrise on the 13th. September 9 – Neptune at Opposition. The planet will be at its closest approach to Earth and will appear at its brightest for the year. Because of its distance from Earth, it will be difficult to spot without a moderately sized telescope. September 23 – Autumn Equinox. The equinox occurs at 2:50am. The Sun will shine directly on the equator and there will be nearly equal amounts of day and night on the entire Earth’s surface. This is the first day of autumn in the Northern Hemisphere and spring in the Southern Hemisphere. October 8/9 – Draconid Meteor Shower Peak. The Draconids vary in drama from year to year. The source is dust grains left behind by comet 21P Giacobini-Zinner, which was first discovered in 1900 and has an orbit around the Sun of 6.6 years. Meteors will radiate from the constellation Draco but can appear anywhere in the sky. The waxing gibbous Moon will hinder good viewing until it sets at 2:44am. 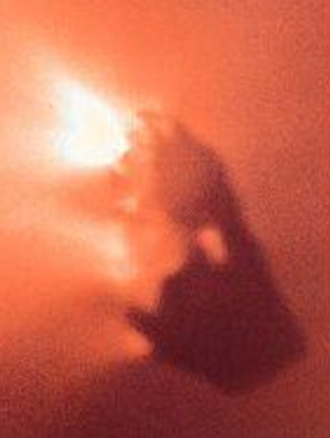 The European Space Agency’s Giotto spacecraft photographed the nucleus of Halley’s comet in 1986. The matter seen escaping from the bright jets may burn up in Earth’s atmosphere as a future Orionid or Aquariid meteor shower. October 21/22 – Orionid Meteor Shower Peak. The Orionids typically produce a maximum of 20 meteors per hour at the peak. This meteor shower, as well as the Eta Aquariids, is produced by dust grains left behind by the famous comet Halley. The shower runs annually from early October to early November. Meteors will radiate from the constellation Orion but may appear anywhere in the sky. Best viewing might be just before the last quarter Moon rises at 12:24am. October 27 – Uranus at Opposition. The planet will appear at its brightest and be fully illuminated during its annual closest approach to Earth. Because of its distance, a small telescope is recommended. November 5/6 –Taurid Meteor Shower Peak. This shower runs between early September to early December and produces about five meteors per hour, which are known for being colorful fireballs. It is unusual in that it consists of two separate streams: the first is from dust grains left behind by Asteroid 2004 TG10, and the second is produced by debris left by Comet 2P Encke. Meteors radiate from the constellation Taurus but can appear anywhere in the sky. Best viewing will be after 12:32am when the waxing gibbous Moon sets. November 11 – Mercury Transits the Sun. The Sun’s closest natural satellite will pass between it and the Earth, appearing as a speck moving across the Sun from dawn to about noon. YOU MUST USE A PROPERLY FILTERED SOLAR TELESCOPE TO VIEW THIS EVENT! 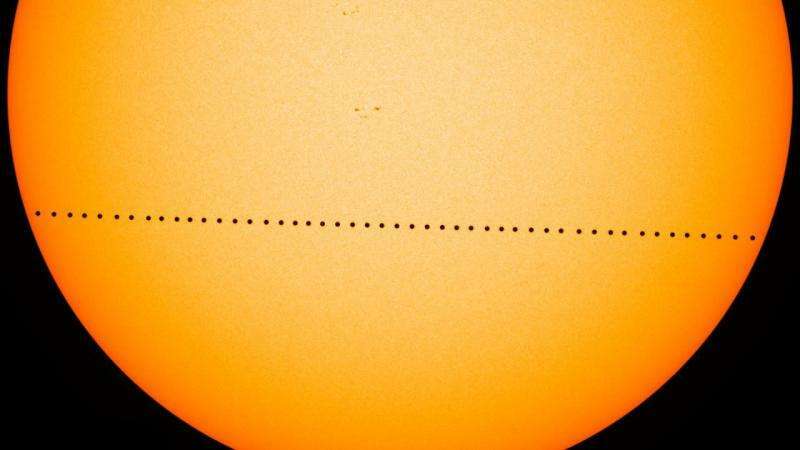 This is a fairly rare event — the next transit of Mercury won’t be until 2039. 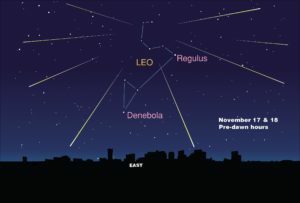 November 17/18 – Leonid Meteor Shower Peak. The Leonids typically display up to 15 meteors per hour at the peak and are produced by debris left behind by comet 55P/Tempel-Tuttle. The entire shower runs annually through much of November. Meteors will radiate from the constellation Leo but may appear anywhere in the sky. Best viewing may be after midnight in a spot that blocks moonlight, for the waning gibbous Moon will interfere after its rise at 9:16pm. 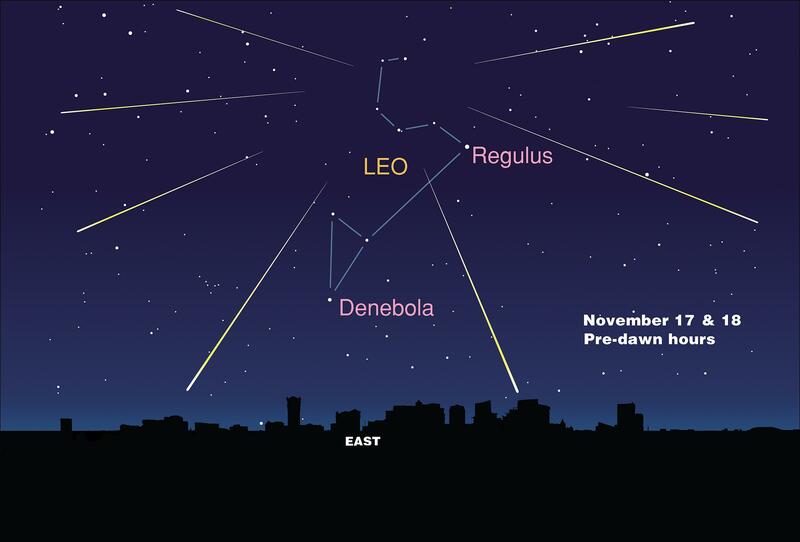 The Leonid meteor shower can be seen most anywhere in the sky, but will be most prominent where meteors radiate from the constellation Leo. Used by permission of The University of Texas McDonald Observatory. December 5-8 – Earliest Sunset of the Year at 4:32pm. 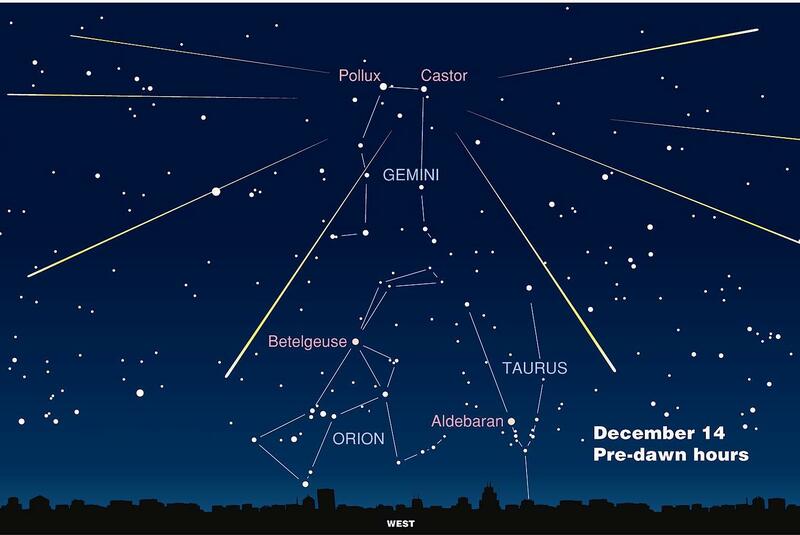 December 13/14 – Geminid Meteor Shower Peak. The Geminid meteor shower is widely considered the most glorious shower, producing up to 120 multicolored meteors per hour at its peak. It is courtesy of debris left behind by an asteroid (3200 Phaethon) rather than a comet. Meteors will radiate from the constellation Gemini but may appear anywhere in the sky. Best viewing is after midnight, though a nearly full Moon will prevent this year’s show from being among the best. The Geminid meteor shower can be seen most anywhere in the sky but will be most prominent where meteors radiate from the constellation Gemini. Used by permission of The University of Texas McDonald Observatory. December 16 – Edward Emerson Barnard Birthday. On this date in 1857, Nashville’s own E. E. Barnard was born to an impoverished widow. After surviving the Civil War, he began working at age 9 as a photography assistant to support his family. As a teenager, Barnard developed a keen interest in the night sky, and through self-study, became one of the city’s leading observational astronomers and Vanderbilt’s first observatory astronomer. In his career at Vanderbilt and elsewhere, his discoveries included more than a dozen comets, the fifth moon of Jupiter, and the star with the fastest proper motion relative to Earth, which now bears his name. December 21 – Winter Solstice. The solstice occurs at 10:19pm. This is the first day of winter in the Northern Hemisphere, which also will experience the longest night, and the first day of summer in the Southern Hemisphere. December 21/22 – Ursid Meteor Shower Peak. The Ursids produce about 5-10 meteors per hour from dust left behind by comet 8P/Tuttle, which was first discovered in 1790. The shower occurs every year from mid to late December. This year, a late-rising crescent Moon shouldn’t hinder viewing significantly. Best viewing will be just after midnight from a dark location far away from city lights. Meteors will radiate from the constellation Ursa Minor but can appear anywhere in the sky. December 27 – The Arthur J. Dyer Observatory and its telescope were dedicated in 1953. We celebrate our 66th anniversary! Research for this calendar was sourced from The U.S. Naval Observatory, Sky and Telescope magazine, American Meteor Society, Lunar and Planetary Institute, timeanddate.com, Tennesseeencyclopedia.net, and seasky.org. Eclipse predictions by Fred Espenak, NASA GSFC Emeritus.